This is a handbook for city officials seeking the affordable, abundant bandwidth their communities will need to thrive in the decades ahead. 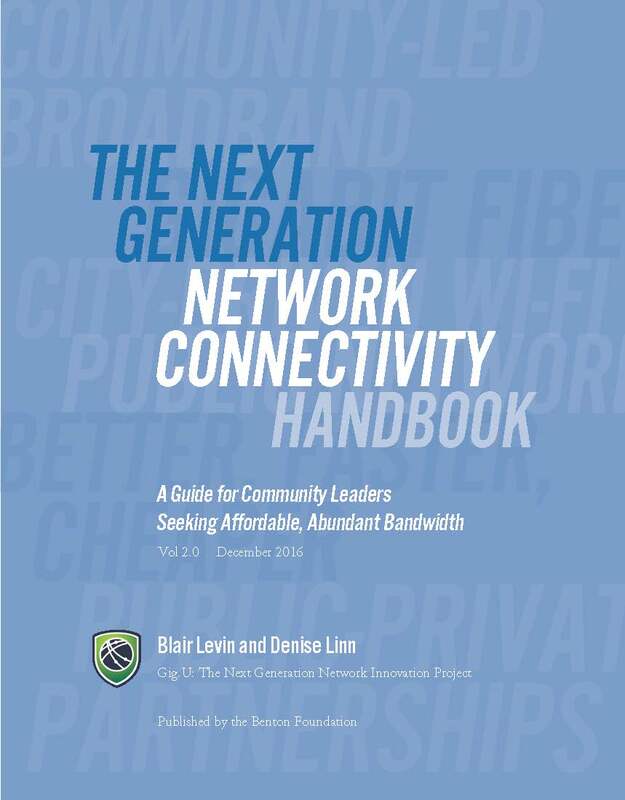 Designed for local decision makers, it reviews the current landscape of broadband networks, including next generation, gigabit capable networks, outlines best practices, summarizes existing models, and presents a framework through which community leaders might begin preliminary project steps given their city’s speci c strengths and circumstances. Our purpose is to lower the initial, daunting information barrier that exists between cities already immersed in these Internet infrastructure issues and those just beginning to navigate them. The Handbook itself is an outgrowth of the many discussions between Gig.U and others deeply knowledgeable on municipal issues, in which it became clear that cities would bene t from a guide to stimulating new investments in 21st century information infrastructure. One of the key insights city of cials provided concerned the importance of the many linkages between deploying such information networks and other municipal policies, including those affecting construction, transportation, housing, and economic development. As a result, at the heart of the Handbook are two critical and related tasks for the city: understanding how its practices affect the economics of deploying and operating next generation networks, and organizing its assets, practices and people to improve its ability to negotiate with third party providers or deploy a network itself. Given the pace of change, this second edition of the Handbook provides a “snapshot” of information for city leaders as of the end of 2016. We anticipate future updates in response to new products, evolving technology, new lessons, and feedback from partners and readers. Our country is still early in its journey to assure that all have access to next generation bandwidth. While cities have led in the efforts to date, most still have not yet started down this path. As they do, we hope this Handbook helps them, and in turn, that their collective experiences will improve this resource, and ultimately bring all closer to affordable, abundant bandwidth now and for generations to come.